This indicator reports the total residential or household use of both primary and secondary energy resources. Primary energy refers to sources from the earth such as fossil fuels (oil, gas, and coal), biofuels (derived from living matter; ethanol, biodiesel, green diesel, and biogas), wind, solar, waves, nuclear, and radiation energy. Secondary energy sources are generated by some primary energy sources. One example of a secondary energy source is electricity. 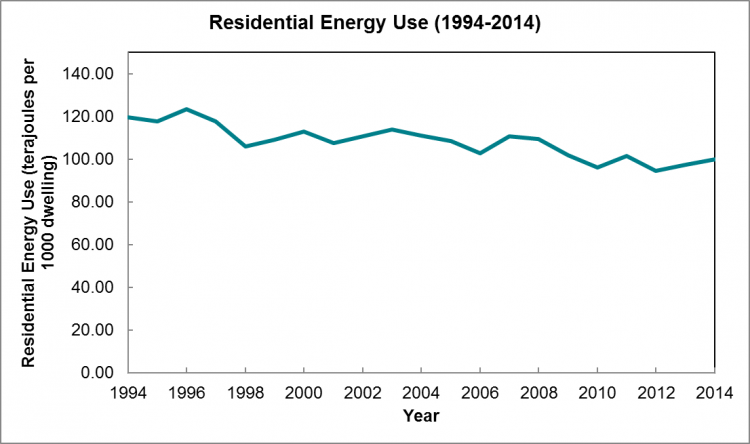 Tracking residential energy use allows us to understand how the energy conservation practices of Canadians are changing over time. This is one area of environmental wellbeing that people can have more control over in their daily lives through conservation activities like turning off lights or turning down their thermostat in winter. We are dependent on energy resources for almost every aspect of our wellbeing. From heating our homes and cooking our food, to powering our workplaces and educational institutions, we need energy. Many primary energy resources are limited, and lower residential energy use suggests to us that Canadians are taking care to conserve energy in their homes.